I on the other hand, am breaking out my pirate outfit and going on a mission! Where's the pirate smiley when you need one? Keep us posted. I believe that if you go into the engineering menu there is a way to "corrupt" the comand system and force it to need a re-flash. I don't remember off the top of my head, but this will force the dealer to load the latest update for comand. Just make sure you don't do this OUT of warranty. It takes about 1-2 hours to fully re-flash the comand. Last edited by jctevere; 08-26-2011 at 01:30 PM. Hi, my first post on this forum. I had my update done today. New features are TMC-Pro support, but that doesn't help me 'cause in South Africa TMC isn't available. There is also the analogue clock on the system page. "Block" feature - whatever that is, in the Navi menu. Boost in Aux menu. Linguistics now works in Navi mode. It also has a Map Version under Navi menu, but mine can't tell me what version I have??? The process took about an hour to do. The Star Diagnostics system said 40 minutes for the one update and 15 minutes for the "Sound" update. I couldn't tell you what version I had before, or what version it is now. I also haven't tried the Bird's eye view - Clouds and Stars I believe. 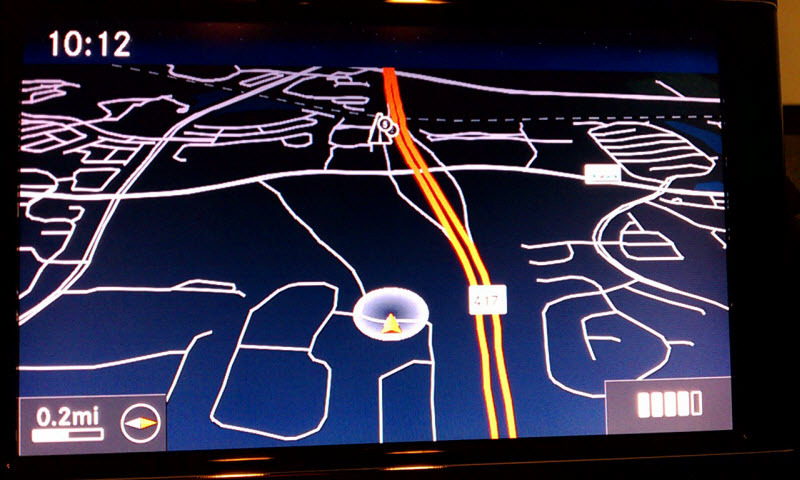 Not sure what TMC is, but yes, I see the Block feature in NAVI as well (it forces the navigation not to use that area when suggesting a route unless it the only possible way. I read that in my MB COMAND guide). hey can you guys post a pic of the birds eye view and clouds/stars things? wanna make sure i either have those or dont thanks! Check post #17 in this thread. I attached a shot of the birds-eye view (just the top part which shows the stars and the time). It's the last picture, in the second row. Someone else mentioned that they saw the clouds moving. I've since paid attention, and can verify this claim. As the road winds to the right or the left, the clouds also move right / left. Hmm mines just a black bar up on top there =/ i must be out of date! Perhaps your version is newer than my previous one, but older than the one they just put on my car..
Good luck! Don't forget to put up pictures of your new MIP. Thanks that proves mines out of date, don't have that view mode! You could take a print-out of the pics to your dealership to prove your point if they act like you've been smoking something questionable..
Hehe, bringing my ipad with this thread open on it. That map view is so much better then the top-down one! The Bird's Eye View was on my system already. 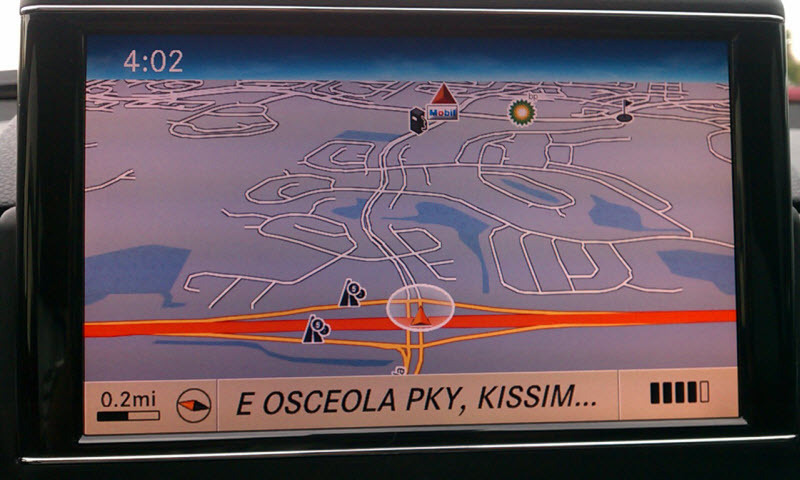 It’s basically what they call the 3D view in Tomtom and Garmin units. I particularly enjoy this view when it’s zoomed out a bit. It’s almost like a flight simulator. Last edited by xolinlevh; 08-29-2011 at 01:34 PM. I have tried two different dealerships with obviously two different SA and no luck. I will try again when I am due for another service this Oct. Its such a hassle to just go in for the damn update, Id prefer to do it during a service so that they know you are spending some money there. I got My Hands on a Mercedes-Benz MELCO COMAND - North America Map DVD v.7 if someone is interested. Thanks.